Announcement PLEASE make sure your shipping address is accurate. I am not responsible for lost shipments due to addresses that are incorrect or missing information. INTERNATIONAL BUYERS: International orders may be subject to the duty/customs taxes and/or fees. These laws and fees vary per country and are the buyers responsibility. All packages will be marked as "merchandise" for their full purchase amount on the customs form. INTERNATIONAL SHIPPING: Please be patient for your item to arrive. Some areas can take up to 4-7 weeks to arrive. If you have issues please convo me directly. I cannot guarantee deliveries to arrive by a specific date (or by the holidays)! Welcome to the online store of Nicole Gustafsson | Original Paintings + Prints + Paper Goods >>> Follow my instagram/twitter @nimasprout to see work-in-progress photos and my latest creations! All items listed here are in-stock and ready to ship within 1-3 days! You can also find my work locally in Portland, Oregon at: Crafty Wonderland, Altar, Nucleus Portland, Collage Annex, and more! Please read over my shop policies for more information. PLEASE make sure your shipping address is accurate. I am not responsible for lost shipments due to addresses that are incorrect or missing information. Photos can’t really do justice to how beautiful the artwork is. High quality paper. Now available is cream-color Shiba Inu print and enamel pin! This piece always reminded me of summer with fire flies dancing in and out of trees. "Firefly Biome", signed fine art print is currently available in my shop! This little crystal collecting wombat is back in my Etsy shop again! My studio where I work. I love painting with gouache! I paint full time and enjoy "creating" worlds and adventures to share with others. 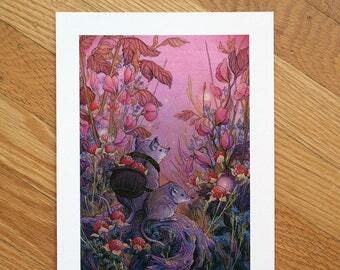 Small painted illustrations featuring badgers, cats and rabbits. Hi there! I'm Nicole Gusafsson and my shop is "Nimasprout". I create original paintings with gouache and ink. From these illustrations I make prints and other paper goods to sell. Common themes in my work are adventure, discovery, and exploration of the environment and natural world. I currently live in the Pacific Northwest with my husband and pets and work as a full time artist + illustrator. 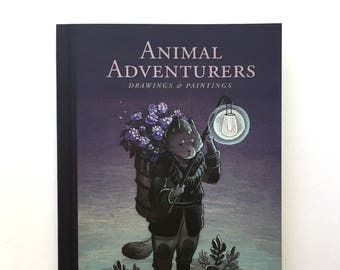 Artist and illustrator living in the Pacific Northwest and specializes in traditional media paintings. Common themes in her work are adventure, exploration, and characters interactions within the environment. Welcome to my Etsy shop! Nimasprout is the studio of Nicole Gustafsson. Artwork is copyright Nicole Gustafsson. Copyright is not transferable with the sale of work. The buyer is not entitled to reproduction rights. Thanks you for checking out my shop! Nimasprout accepts the following forms of payment: CREDIT CARD, and PAYPAL. Payment through Paypal or Direct Checkout is expected immediately following your purchase. Washington residents will be charged appropriate sales tax for your county. This will be automatically figured in checkout. Payments must be received in full before orders are shipped. All artwork is packaged for shipping in sturdy, tidy cardboard packaging. I ship everything USPS. Please contact me if you have special delivery needs and I will happily cater to your needs. Additional charges may apply to orders requiring special delivery, rush delivery, signature conformation, or international shipping. I ship to the shipping address you supply in checkout. PLEASE MAKE SURE YOUR ADDRESS INFORMATION IS CORRECT. If the buyer supplies an incorrect shipping address, any delays or costs associated with re-shipping packages or loss of goods are solely the buyers responsibility. You are a provided a tracking number when your items ships and you can get updates thru the USPS link you are provided. PLEASE NOTE that Nimasprout is not responsible for stolen or lost merchandise. It is your responsibility as the buyer to have items shipped to a secure location and to follow the tracking number. Once the package is shipped it is out of my hands. INTERNATIONAL SHIPPING: International orders may be subject to the duty/customs taxes and/or fees. These laws vary per country and are the buyers responsibility. Your package ships with the required customs form label required by USPS mail. This has the contents and purchase price of your items on the label. PLEASE NOTE that packages take time to go thru customs and I have no way of guaranteeing any delivery date on international shipping. Please be patient for your item to arrive. Some areas can take up to 4-8 weeks to arrive. If you have issues please convo me directly.